MAPOLO New Version Reverse Umbrella - turn the world of umbrellas upside down, stop water dripping on you by opening in reverse! Type: 1. Umbrella made of double layer waterproof pongee cloth. 2. One Button push and pull to open or close umbrella,8 fiber bones and carbon fiber stick, the advantages of high strength,toughness, light and strong; C-shape handle design, holding comfortable and convenient. 3. Innovative design allows you to close it in an inverted/reverse direction, which means the outside layer will become the inside layer after closing, so you can put it directly anywhere in a car or a room without making the seat or floor wet, and even other people standing beside you on a bus or the subway will not get wet, either. 4.Pinting technology: umbrella inner fabric using digital printing to prevent fading, lasting effects. Umbrella outer fabric with pure black ultra-waterproof umbrella cloth. Durably Windproof: double layer pongee umbrella cloth, 8 fiber bones and carbon fiber stick, multi-color available. Fashion C shape handle ,cross the C-shape handle over your arm and made you hands free. convenient for you to using a mobile,holding a bag. 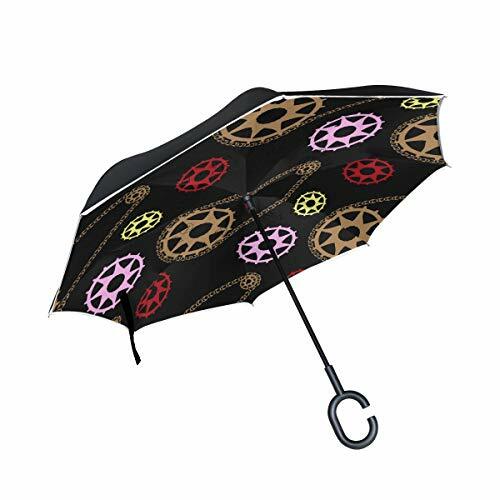 Umbrella Size:Open Length 43.3 inch, Folded Length 31.5 inch.Control:Non-automatic. Inverted Design:One button to easily open this inverted umbrella, inside-out design prevents water from dripping, keeping floors and cars dry. It will also keep the wet part of the umbrella inside once you've closed it. Gift Idea: a necessary tool for your car and outdoor travel. Wind proof, sun & rain available and anti-uv, make it a perfect Christmas gift or Birthday gift for your partents, friends, colleagues and lovers. If you have any questions about this product by MAPOLO, contact us by completing and submitting the form below. If you are looking for a specif part number, please include it with your message.